Hemp oil is like any other oil made from nuts or seeds. As its name suggests, it comes from hemp, which is commonly known as marijuana_._ Although its name and source might make you think twice, hemp oil is packed with nutrients and easy to cook with. Hemp oil comes from cannabis, specifically Cannabis sativa. This is a common type of the marijuana plant, so hemp oil and marijuana oil may often be confused for the same product. However, hemp oil is a healthy, nutty-flavored oil that can be easily integrated into your cooking. Hemp oil is considered so nutritious that it is often used in animal feed to improve the nutritional quality of meats. Hemp oil is nutritious because it's rich in essential fats as well as antioxidants. These benefits come from hemp seed, which is high in protein. On its own, hemp seed is very nutritious. However, the pressing process used to turn it into oil improves it nutritionally by increasing its essential polyunsaturated fatty acids. 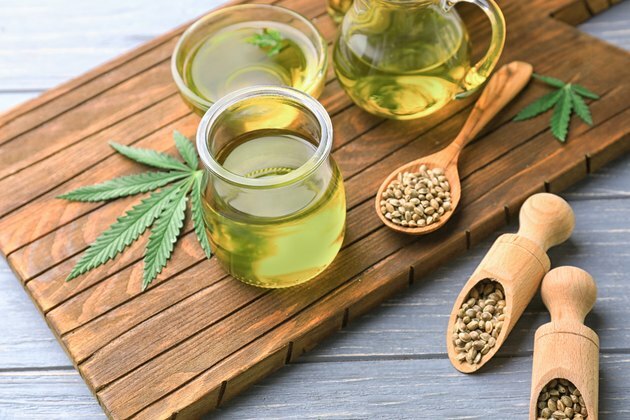 In addition to its nutritional value, hemp oil also has a variety of topical applications, and you may frequently find it integrated into various types of cosmetic products. Hemp oil can also be used as a component of biofuels. It may even be used to make paints. Hemp traditionally has been used for a variety of applications, from paper to 3D-printer filaments or animal bedding. This means that hemp is an ecologically friendly material, and the whole plant can be easily used — not just its seeds. There are many types of omega fatty acids. Some of them are essential, like omega-3 and omega-6, and others are not, like omega-9. Hemp oil contains abundant essential fatty acids, like omega-3 and omega-6. Omega-3 fats support the health of your brain, lungs, gastrointestinal tract, heart and various other organ systems. Omega-6 fats are important for the healthy function of your immune system and metabolism. It's usually easy enough to obtain omega-6 fatty acids. Western diets are rich in these fats, which are commonly found in nut, seed and vegetable oils. In contrast, it's much harder to find good sources of omega-3 fatty acids. The specific omega-3 fatty acid that can be found in plants is called alpha-linolenic acid (ALA). There are other types of omega-3 fatty acids, but the other omega-3s are typically found in marine animals and plants or fortified products, like eggs. The Dietary Guidelines for Americans currently recommend the consumption of 1.1 to 1.6 grams of ALA each day as part of a healthy diet. However, a 2019 study in the Proceedings of Nutrition Society Journal has said that this value may go up to a total of 2 grams of ALA per day. While hemp oil is full of essential omega-3 and omega-6 fatty acids, this isn't the only benefit it offers. Hemp oil is unique because, unlike other nut and seed oils, it has a low ratio of omega-6 to omega-3 fatty acids. This is important because a specific ratio of omega-6 to omega-3 is considered ideal for good health. Since most people who consume a Western diet frequently cook with nut, seed and vegetable oils, they tend to consume a large amount of omega-6 fatty acids. This means that most Western diets have an omega-6 to omega-3 ratio in the range of 15-to-1 to 16.7-to-1. Ideally, a much lower ratio of omega-6 to omega-3 (in the 3-1 or 2-1 range) is best. Consuming the right ratio of omega-6 to omega-3 fatty acids is important because it helps various bodily systems function better. The 3-1 or 2-1 ratio may help reduce inflammation in people with inflammatory diseases, and even slightly higher ratios at around 5-to-1 may be helpful for people with asthma. In contrast, ratios around 10-to-1 start producing negative effects on your health. While omega-6 fatty acids are typically good, too many can increase your chance of diseases like cancer, heart disease and autoimmune diseases. This can include a range of conditions, like inflammatory bowel disease or rheumatoid arthritis. Choosing oils, like hemp oil, which have the right omega-6 to omega-3 ratio, can help reduce your risk of these problems. Although the primary benefits of hemp oil come from their essential omega fatty acid content, there are other benefits to hemp oil. Hemp oil has been shown to offer antibacterial activity against a range of common disease-causing bacteria, including Escherichia coli, Staphylococcus aureus and Pseudomonas aeruginosa. Hemp oil also contains a variety of beneficial phytocannabinoids, terpenes and phenolic compounds, including flavonoids. Terpenes are the same substances you'd find in essential oils, while flavonoids are antioxidants. One particular phytosterol in hemp oil, beta-sitosterol, is known for being able to reduce inflammation and cholesterol. Furthermore, the antioxidants in hemp oil have an array of recognized health benefits. However, many of these other compounds have benefits that aren't very well understood. Despite this, they're all considered to be pharmaceutically valuable, which means that hemp oil may have even more health benefits that have not yet been explored. Marijuana oil can come from several cannabis plants. These are generally known as Cannabis sativa and Cannabis indica. Both of these strains have psychoactive compounds and nonpsychoactive compounds. The primary psychoactive compound cannabis is known for is called tetrahydrocannabinol (THC). This is the component of marijuana that is well known for giving you a "high" when you smoke or eat the plant. THC binds to receptors in your brain known as cannabinoid-1 receptors in order to produce these effects. Cannabis's best-known nonpsychoactive compound is called CBD (cannabidiol). CBD is more commonly known for its pain-relieving effects, though it has a wide range of health benefits. Marijuana oil has both THC and CBD. Although hemp oil comes from a similar source to marijuana oil, it has neither of these compounds. Despite being the same type of plant, the cannabis used to make marijuana oil and hemp oil is quite different. Marijuana cultivation is focused on the flowers and leaves of the plant, while hemp cultivation focuses on the stalk and seeds. This means that these two oils are often also coming from different parts of the cannabis plant. Typically, anything labeled as marijuana oil contains THC, with variable amounts of CBD. There is usually much more THC than CBD in marijuana oil. This means that marijuana oil, unlike hemp oil, has psychoactive substances. Unless you live in an area where cannabis is legal, marijuana oil is typically considered an illegal substance. It's usually the THC in marijuana oil that makes it legally questionable, rather than the CBD. In contrast, hemp oil lacks these psychoactive and nonpsychoactive compounds and is legal everywhere. Since marijuana oil, cannabidiol oil and hemp oil can all be used topically, ingested alone or used in various types of food products, you may be concerned about mistaking one for another. However, you'll only find hemp oil — the cannabis-derived oil that lacks THC and CBD — in supermarkets. Cannabidiol oil, also known as CBD oil, is essentially marijuana oil that has different proportions of psychoactive and nonpsychoactive compounds. While marijuana oil may have variable THC to CBD ratios, CBD oil is rich in CBD and low in THC. Most CBD oil products have only trace amounts of THC, which means that they are considered nonpsychoactive. However, despite being considered nonpsychoactive, CBD is still considered a restricted substance in many places. CBD oil is commonly used for medicinal purposes. THC also has a variety of medical applications, but since CBD is nonpsychoactive, it has become more popular as a health product in recent years. The specific benefits of CBD oil depend on the type of plant from which it was made. CBD oil can be made from both Cannabis sativa and Cannabis indica. CBD oil is FDA approved as the drug Epidiolex. Epidiolex can be used to treat certain types of epilepsy, like Lennox-Gastaut syndrome and Dravet syndrome. You can also find CBD oil made by a variety of non-FDA-approved manufacturers. CBD oil can be made in multiple ways and may be used for anything from cooking to recreational purposes. The main negative of hemp oil comes from any trace THC that can be found in this product. Before you get too concerned, any THC or CBD in hemp oil shouldn't make you test positive for cannabis use. However, this depends on your consumption. Despite having only trace amounts of THC and CBD, hemp oil products may have as much as 117.5 milligrams of THC per gram of oil. The average drug test typically screens for a level of about 50 ng/mL of THCA (the metabolite of THC that would be present in your urine after taking cannabis). People consuming moderate amounts of hemp oil prior to tests have shown levels as high as 49 ng/mL of THCA, and it is possible to test false-positive for cannabis use when consuming large amounts. While irregular consumption of hemp oil may not affect drug tests, you may want to reduce your consumption if you have one scheduled before the start of a new job. The good news is that, if you have tested false-positive because of the amount of hemp oil you've been using, your levels should go down as soon as you stop consuming hemp oil products. Can Canola Oil Be Substituted for Vegetable Oil in Brownies?